YOU CAN ALMOST hear the sound of knives being sharpened as we await the revised plan for MetroLink, the planned light rail service running from Swords to Sandyford. The next iteration will be unveiled in the coming weeks before another round of public consultation – and no doubt another round of whingeing and unambitious negativity from the usual suspects. A timely reminder of why the MetroLink project is so important came in recent weeks when Dublin Airport announced that just shy of 30 million people had walked through its doors in 2018 – a 60% increase since 2010. That kind of growth makes Dublin the envy of just about every other major airport in Europe. Of course, this growth has only been made possible by a decision taken in 2007 to build Terminal 2. At the time it was billed as a ‘white elephant’ project. When it opened in late 2010, the same voices said it had been built too big and that there was no need for it. Fast forward to today and Terminal 2 is virtually full at peak times. That was €920 million well spent. 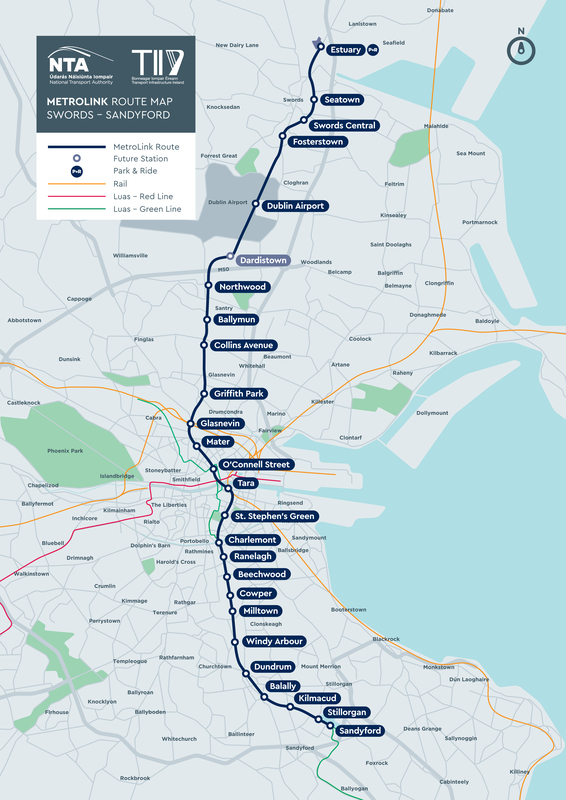 The same ambition that was shown with Terminal 2 is now required for MetroLink – an investment that would provide the spine of a public transport network that can serve Dublin for the next 150 years. It’s an investment we’ve been stalling on for far too long. Of course, procrastination and transport projects go hand-in-hand in Ireland. That’s why so many of us are stuck in traffic jams every day. It’s why so many of us face lengthy waits at bus and Luas stops. It’s the reason why our cyclists are forced to mix in with buses and cars as they pour into the city in ever-increasing numbers. While our airport’s growth may be the envy of our European peers, the lack of a direct rail link to our national airport certainly is not. Indeed, it should be considered a national embarrassment. I was reminded of this just last week when I sat down with the head of HR in one of Dublin’s most successful indigenous companies – a firm employing almost 1,000 people in the heart of the city and bringing in hundreds of global staff each month for training and meetings. For these types of companies, MetroLink can’t come quick enough. It’s a project that we’ve been talking about and stalling on for far too long. Of course, you could say the same about so many public transport projects in Dublin. Not least among them is Dart Underground, which was first mooted in the 1970s, but frustratingly won’t even be considered for construction until, most likely, the 2030s. Building MetroLink wouldn’t just benefit the Dubliners of today; it’s a project that stands to benefit multiple generations to come. Just look at London where the decision to go underground is still benefiting its people 156 years after trains started rolling on its tracks. Delivering MetroLink will require a step change in how our decision makers think and plan for Dublin, which currently languishes around the mid-30s in world rankings for urban quality of life. The government offered some hope when it stretched the time frame of the National Planning Framework out to the year 2040. The Ireland 2040 plan was welcome too, earmarking many of the infrastructure projects needed to support the expected growth of Dublin and the other city regions in Ireland over the coming decades. But Dublin’s trouble, of course, has never been a lack of plans. Getting them off the page and into reality is the problem. All too often, the inclination is to avoid making a decision and to find a reason to kick the can down the road. If only the delivery of new public transport projects in Ireland was as reliable and consistent as the conveyor belt of naysayers who raise their voices anytime a big investment is mooted. “It’s too expensive; it’s serving the wrong area; they built the same thing abroad in half the time.” Like the underground in London, you can set your watch by them. It’s argued that the cost of building MetroLink is too high. But what is the cost of not building it? The Department of Transport’s own figures indicate that traffic congestion in the Dublin region already costs the economy €350 million every year. By 2033, the annual cost will be over €2 billion – roughly half the price of building MetroLink. MetroLink will be one the biggest and most ambitious transport projects ever delivered in Ireland. That should not put us off building it, but rather the focus must be on delivering the best piece of infrastructure that we possibly can. The preferred route that was published by the National Transport Authority and Transport Infrastructure Ireland in March last year was not perfect. It’s likely that the new soon-to-be-published version won’t be either. But if we wait for perfect, we’ll never good, let alone great. Graeme McQueen is head of communications at Dublin Chamber.